Show your dog who’s a good boy with the Kingdom Pets Chicken & Sweet Potato Jerky Twists Dog Treats. Made especially for pet owners by pet owners, the treats are made with only 100% natural ingredients. In fact, using a limited-ingredient recipe that is dehydrated for up to 16 hours, all that’s left is a high-protein and tasty reward that leaves mouths watering and tails wagging. And with safety and quality in mind, every batch of treats is tested for quality and uses USDA guidelines for human food production—because we love our dogs like people! 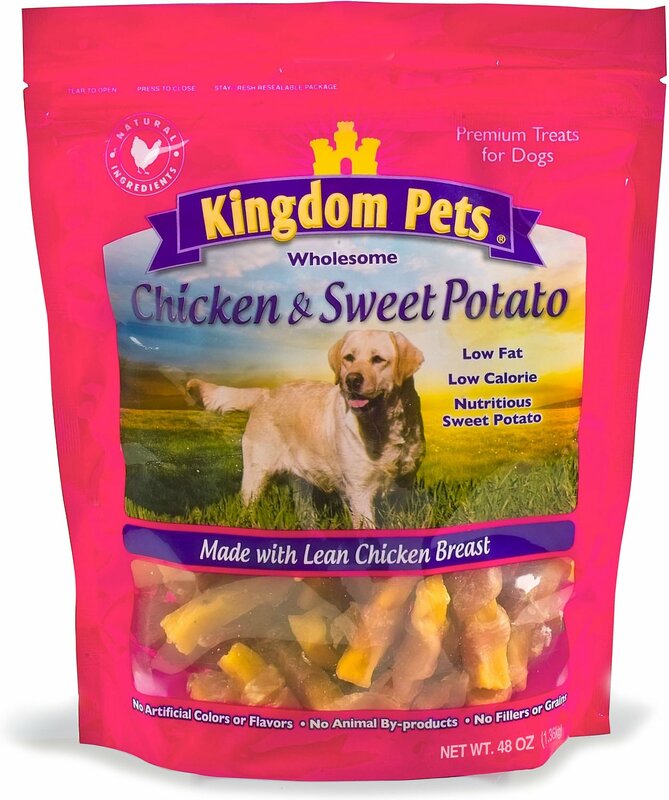 Jerky dog treat made with real lean chicken breast hand-wrapped around nutritious sweet potato. High-protein and low-fat recipe that serves as an easy and delicious way to add veggies to your pet’s diet. Contains zero fillers, soy, grains, sugar, by-products, colors, or flavors. Made with 100% natural ingredients because your pup deserves nothing but the best. Family-owned company tests every batch for safety and uses USDA guidelines for human food production. 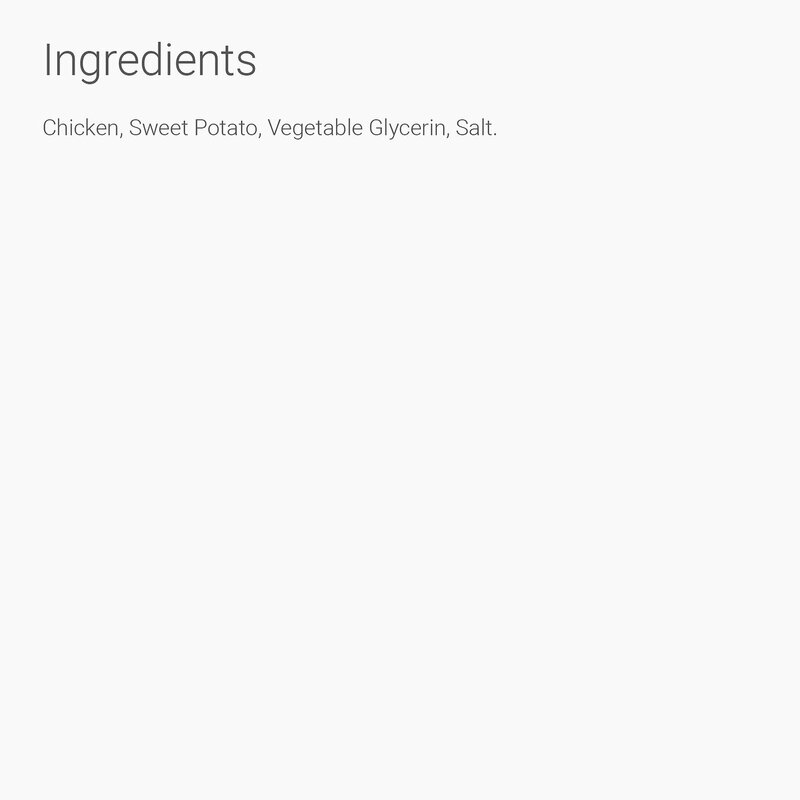 Chicken, Sweet Potato, Vegetable Glycerin, Salt. Treats are not a substitute for a complete diet with balanced nutrition. Overfeeding a dog is not healthy and can sometimes be harmful. It is important to remember that feeding guidelines should be followed and the actual feeding amounts be adjusted according to your own dog's needs. For smaller dogs, we recommend breaking the treats into bite - sized pieces. Always monitor your dog when feeding treats and provide plenty of fresh water. This is dehydrated sweet potato pieces wrapped with a very thin strip of meat, which means the price is pretty high, relatively speaking. HOWEVER, my dog loves this brand and is happy whether she gets veg or meat. I chop them small so I can treat more often. The service from Chewy was fantastic--I received my order in two working days. My Dog LOVES these treats. He does every trick he knows when he sees me get the bag. This was the first introduction of the item to the pet. 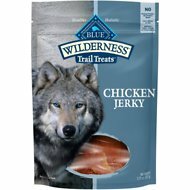 My dog wouldn't touch these treats and the flavor is her favorite. I just wasted my money. Note this review rates the product not Chewy as a company or their service. I cannot suggest them to other owners as a result. Best food, cheap prices, and super quick delivery!!!! My three fur babies love these treats. I like them because they don’t have sharp ends like the sweet potato fries do. I feel more comfortable giving the to them as they are softer. Will continue to purchase these. Chewys is so fast and convenient. Buddy enjoys his sweet potato and chicken jerky treats! They are soft and good as I can tell when I see him eating them, he is 10 years old and I don’t want to give him anything that will hurt his teeth so this is just perfect! My dog loves sweet potato treats. Mable enjoys these and never refuses her treats. The price is comparable to local stores; having them auto shipped with her dog food eliminates an extra errand stop. Nice big bag. Dogs love these treats so far. Better quality than those from local store.